Greek mythology has had a massive influence on art, and this knifeâ€™s story of Medusa and Perseus has been portrayed in stone, oil paintings, and virtually every form of art. According to the myth, peering at Medusa would turn one to stone. So when Perseus went to fight her, he used a mirror shield to reflect Medusaâ€™s image back to her, and thereby turn her to stone. This enabled him to slice off her head and become a famous hero. Levinâ€™s knives are so rare that only two or so are seen each year on the web. Heâ€™s also one of only two makers that tools the knifeâ€™s handle from one solid piece of steel. 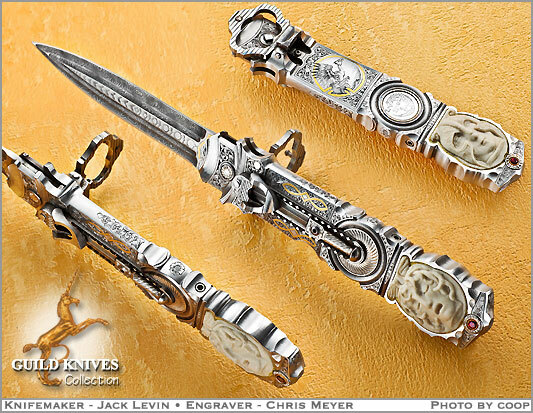 Engraver, Chris Meyer, amplifies this knife, with profusely engraved, 24K Gold inlays. Plaques of bas-relief Bisque are inset, depicting Medusa on one side and Perseus on the other. A carved French Poniard guard pops up, when the release is pressed.